Clover, the black lab puppy mauled by a bear in February, has fully recovered and is back to running around and chewing on sticks, her owner said. The puppy mauled by a bear in the Dedham woods off Route 1A in February has fully recovered from the attack, her owner said. 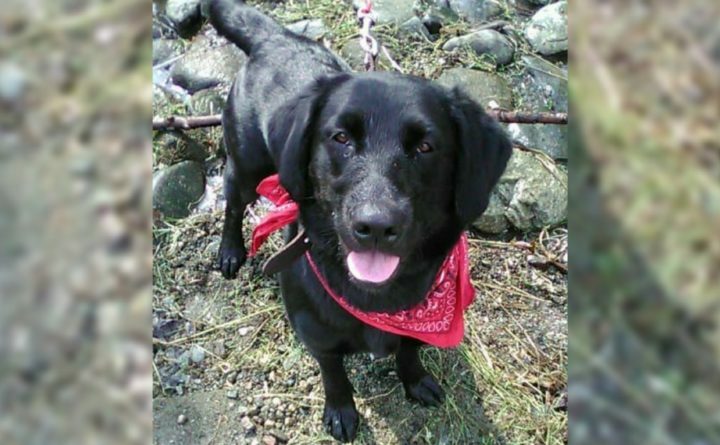 Clover, a then-11-month old black Lab mix, suffered a deep puncture wound that required daily trips to the vet for at least a week after she was tackled by a young black bear the afternoon of Feb. 5, said Dustin Gray. Two months and $3,000 in hospital bills later, Clover is “a happy, normal dog again,” he told the BDN. “She is doing absolutely amazing and is the best dog,” Gray said. The only indicator that she was recently mauled by a bear is when she “sits with her paw up off the floor a little sometimes, but not because it hurts,” he said. Otherwise, Gray said, she’s back to running around, chewing on sticks, and playing with seashells on the beach. The attack roughed up the 29-year-old Orrington construction worker, too, when he ran over and fought the bear off his dog, he said. Gray said he got the wind knocked out of him when he punched, kicked and ultimately jabbed the animal in the eye, prompting it to run away and topple him over in the process. He was later treated at the hospital for minor scratches and bruises, but “I’m doing great,” he said.